CZ53: REDUCED! 1.52 Acres with 101 feet of Sea front off Consejo Road, Corozal District! Retire in Corozal along the Caribbean Sea! 1.52 Acres with 101 feet of Sea front only 3 ¼ miles off Consejo Road, Corozal District! A great property with great potential for someone interested in living on the Caribbean Sea and not paying an eye for their dream place! This property consists of 1.52 acres with +-101 feet along the beautiful Corozal Bay (Caribbean Sea) in an area where real estate development is exploding with medium to high end homes being built. There are numerous homes already built on the adjoining subdivision and electricity is right on the property and ready for you to build your dream home. The property is accessed by an all-weather road and electricity passes along the main access road which gives greater value as one can commence construction. The property is only 1.5 miles off the Consejo Road at mile marker 3 ¼ which means Corozal Town is approximately 4.75 miles from the property. One can get to Corozal Town within 10 minutes drive where you can do all grocery shopping, have medical facilities, restaurants and bars. Corozal Town is approximately 20 miles from the nearest Mexican City of Chetumal, Quintana Roo. One can get on the Mexican side within 30 minutes and there are better facilities with better shopping, great night entertainment, restaurants and medical facilities. From Chetuaml City, one can also get on a Mexican ADO Bus Line and can travel to Cancun or Merida in Mexico. Indeed the property is very long and narrow but having 101 feet along the coastline it gives you enough room to build even a small hotel, Cabanas, Guest House or even a bar and restaurant. The property could be used for mix-application and one can capitalize on the growing needs of rentals and hotel rooms in Corozal. The photos show the property two lots away are undergoing home construction in the adjoining subdivision. The owner of the adjoining property has filled an area leading to the sea and has placed boulders along the coastline. One can observe the photos of the adjoining property and the adjacent subdivision development. The 1.52 acres is in pristine natural state with small second growth trees, shrubs, grass etc,. The property is in its natural state but one can develop this beautiful property with sustainability and “Green Conscience” to provide a jungle/beach feel- the perfect marriage! It is a gem in the rough but the end product depends on you! The coastline in Corozal area is a mixture of broken coral, shells, rocks and white sand. The property has virgin sea front but it was observe some erosion that is not affecting the property at this time and one can see that if one can clear the sea frontage a nice sandy bottom will be exposed and with constant maintenance the beach will be phenomenal. The view to the Corozal Bay (Caribbean Sea) is beautiful as one can appreciate in the photos. The Corozal Bay during the dry season (+-December to June) it has a myriad of milky green turquoise colours but when the rainy season the water coloration changes due to the rains and because of two rivers that emit silt into the By; The New River on the South East of the Bay and Rio Hondo River on the north bordering Mexico. The views are beautiful none the less and across the Bay one can see the distant Mayan Ruins of Cerros. The property has great potential and a property priced at this will not last long. Make an offer! 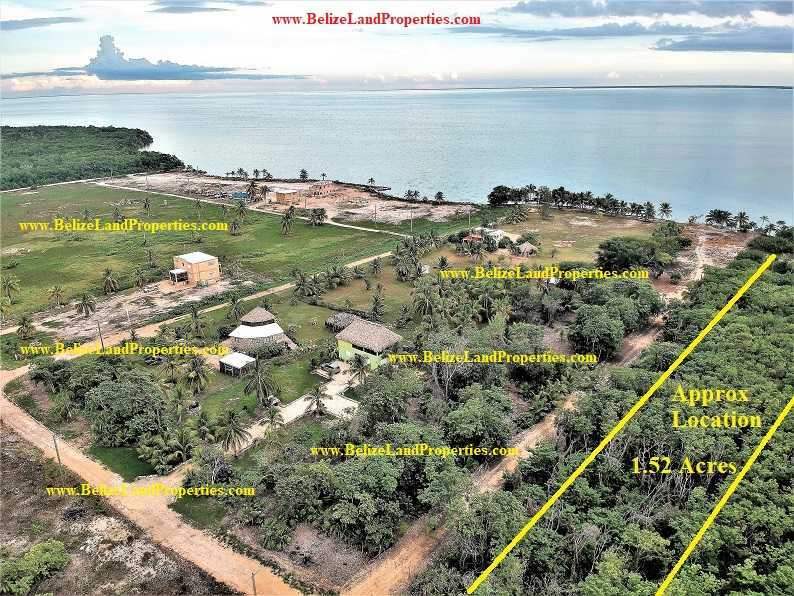 << CY74: 10.01 Acres of Fertile Land in Franks Eddy, Cayo District!